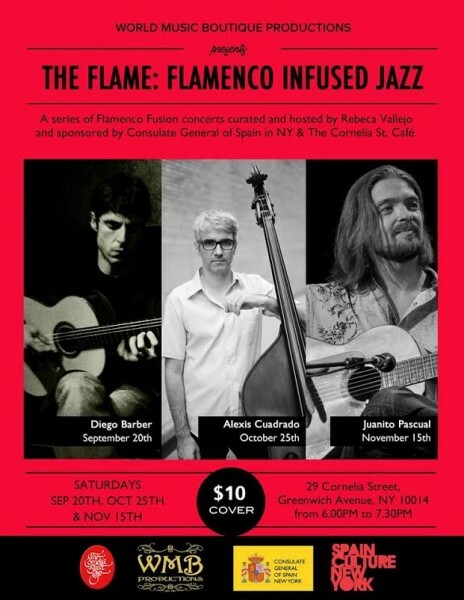 The Flame is the first jazz-flamenco festival in the United-States, and it was launched this year under the sponsorship of the Spanish Consulate in NYC and Cornelia Street Café. Spanish vocalist Rebeca Vallejo’s relationship with the Spanish Consulate has allowed the idea of this original cultural event to come to life. After last’s summer session, this concert was the first of the Fall season. 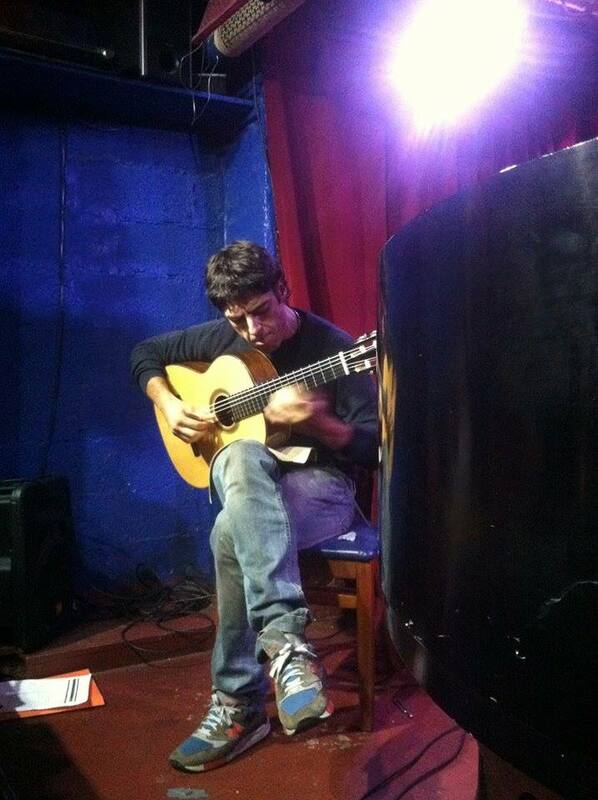 Spanish guitarist Diego Barber and Cuban pianist Fabian Almazan were the main actors of this evening, ending with a last song featuring Rebeca Vallejo. Taking place at Cornelia Street Café, the setting was already inviting with its warm and intimate decor in blue and red tones. The first track ‘Killian’s Moutains’, from Diego’s last album Tales, creates the mood that will characterise the rest of the night up to the last song: a beautiful eerie feel, navigating between dark moods and flashes of warm light, mixing classical and jazz, all the while retaining the gravity and fatalistic feature of flamenco underneath. The complex entanglement of guitar and piano, both with their warm flavor in their own way, delivers an interesting and, for sure, unusual product. Actually the round smooth side of the piano does temper well the guitar’s distinctive hoarse side, and the two dance together in a wavy pattern quite naturally, making the listener almost forget the hours of work they’ve put in it. ‘Lanzarote’, name of Diego’s place of birth, offers a warmer Spanish-sounding track mixed to contemporary jazz – you could actually easily picture yourself in the middle of the dunes here. The following ‘Desierto’ is a little more lighthearted as well, Diego and Fabian make up a funny quirky dialogue, as elusive as a butterfly; then ‘Cipres’ follows, beginning very rhythmically with the guitar, the piano then drawing on this regular basis to make up his solo. We can hear the German influences in Diego’s play – after all he’s been studying music in Germany for a while. The two musicians then go on a short improvisation session, showcasing their modern jazz skills. Accompanied by the piano’s syncopated rhythm, Diego once again exposes his mastered dexterity and it surely amazes everyone, even those not necessarily fond of that kind of music. And to end in apotheosis, a trio is formed by the joining of Rebeca Vallejo who has smartly chosen, before ending the concert, a Brazilian jazz song entitled ‘Pra Dizer Adeus’ – To Say Goodbye. Somehow sinking into the music, Rebeca sings in a playful jazzy voice which, from time to time, bursts into an enjoyable full flamenco timber. Besides the fact that the microphone for her voice part is a bit too loud compared to the other thus eclipsed instruments, it is a fine last song – indeed a burning end for The Flames’s festival’s beginning.